... innovation and high performance: the aluminum lugs fixed on the steel plate enhance the radiant surface by increasing the radiator efficiency for absolute comfort and well-being. ... the redefinition of the criteria of the heating body, thus enhancing its functionalities. Lines become ethereal. The radiator becomes pure cult. According to the market tendencies Foursteel® presents the new radiator Diamond XS Copper. Entirely produced in stainless steel and with a new finishing in copper. Available in the electric version or in the central heating version. Height : 1800 mm – Width : 600 mm – Finishing : White RAL 9016 – Power 455 Watt Classic and sinuous lines gives shape to this piece , with different finishing you can choose its tone , from modern to gorgeus. 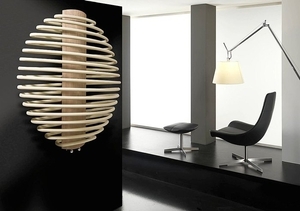 While a standard radiator may be functional, with straight lines, a design model expresses an original concept through its color, form or finish. It is intended to stand out from its surroundings rather than be hidden away. It may be wall-mounted, suspended from the ceiling or even portable. On ArchiExpo, these devices are categorized by properties such as material or power source. Standard radiators are sometimes considered clinical, industrial or unappealing. Design versions come in an exciting range of sculptural shapes, which can be ideal for locations where the heating system is visible. Some may have adjustable thermostats or integrated towel racks. Portable designs may even have handles. These radiators include both hot water and electric models. Unusual finishes include glass and wood. Consider the choice between hot water and electric models. Installation location is important. Placing the heater near a window may warm cool air entering the space. Determine energy efficiency and decide whether the radiator will be fixed or portable. Evaluate cleaning and maintenance requirements. Complicated forms may be harder to clean than simple ones. Decide on extra features such as an adjustable thermostat, towel rack or programmability. Ensure that it complies with local regulations, especially those concerning fire hazards.